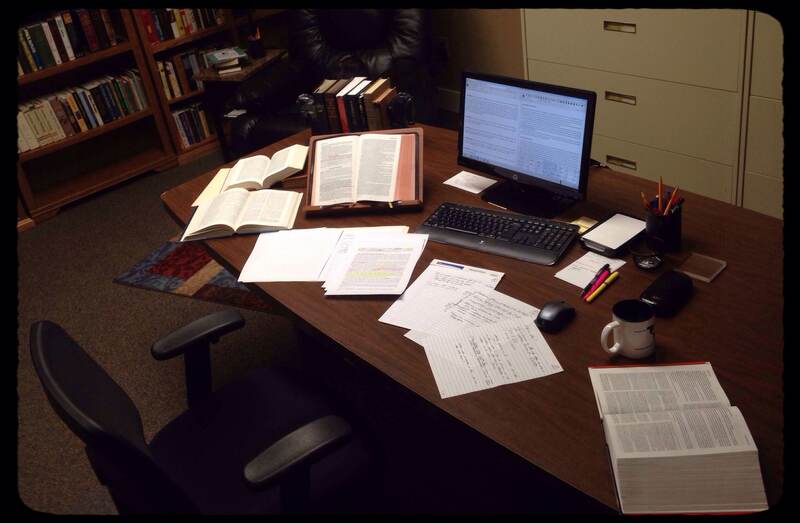 I have a separate, very private and quiet room where I do most of my study for preaching and teaching the Bible. It’s located in the lower level of our Administration Building, away from the busyness of the church offices. I spend most Tuesday-Friday mornings here, studying the Word and preparing messages and Bible studies. 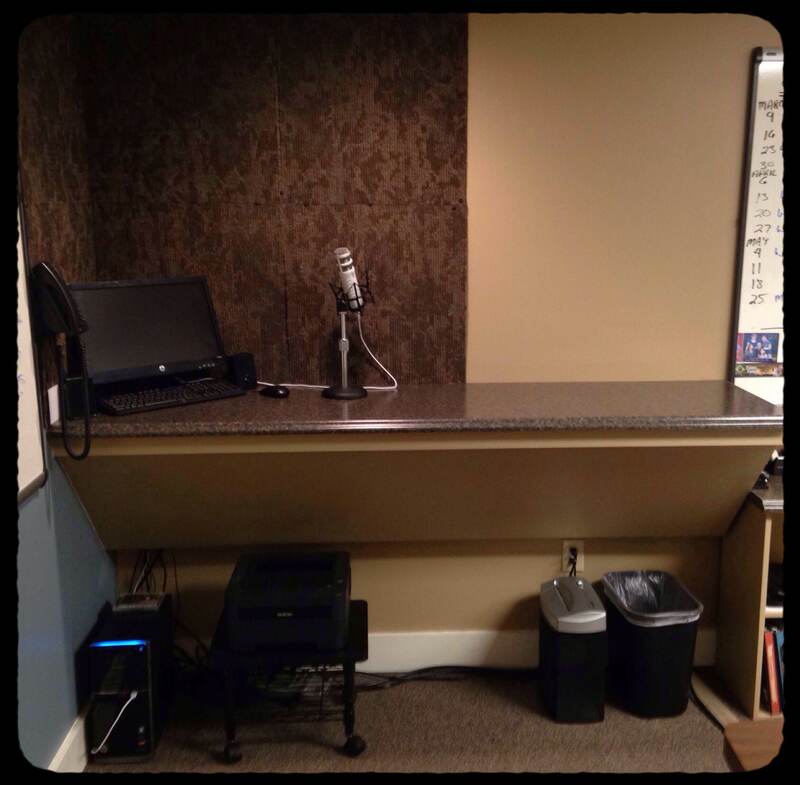 I do some planning and audio recording here as well. I’d like to give you a tour. This is the entrance. 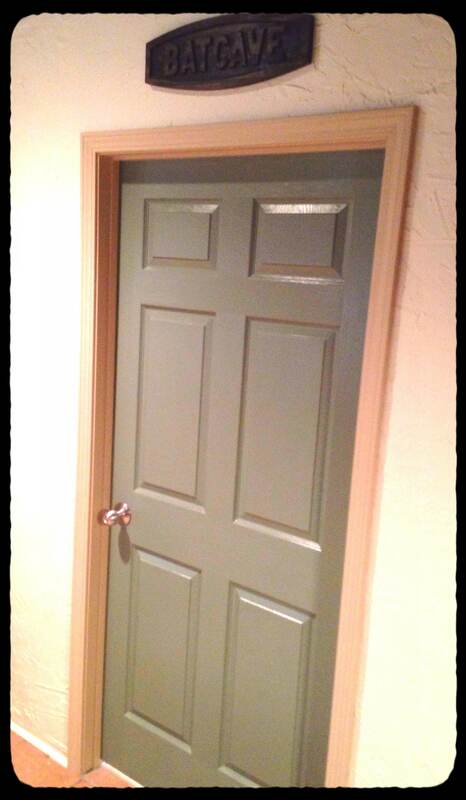 When I turned this room into my study, someone started calling it The Batcave, and it stuck. My wife had this sign made and gave it to me for Christmas. Here you can see most of the room, with my study desk in the center, and the bookshelves, filing cabinets, whiteboard, and reading corner. This is my study desk. Here’s what it looks like on Friday morning. It’s actually an old conference table that was brought to the church by teens on a Bigger and Better activity a few years ago. It served as a game table for the youth group for a while, and now I use it. It’s perfect for spreading out my study materials. The window open on my computer desktop is Logos Bible study software, which contains my primary tools for exegeting the Word. I keep a few hard copy books within arm’s reach. 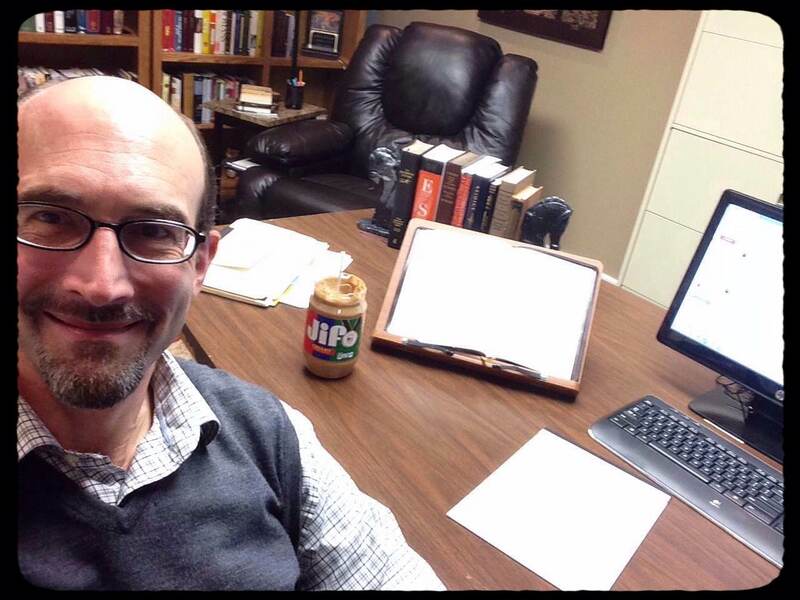 The area behind my desk is custom-built for visualizing and organizing my message preparation. I put the schedule for upcoming messages on the whiteboard, and keep files, books, and notes related to those messages on the shelves underneath. I use this stand up area when I want to be on my feet instead of being sedentary all day. There’s an additional computer monitor I can use, and it’s also where I record audio, which I did when we had a radio broadcast and am about to begin using it to try podcasting. On another wall is my “Vision and Plans” whiteboard. 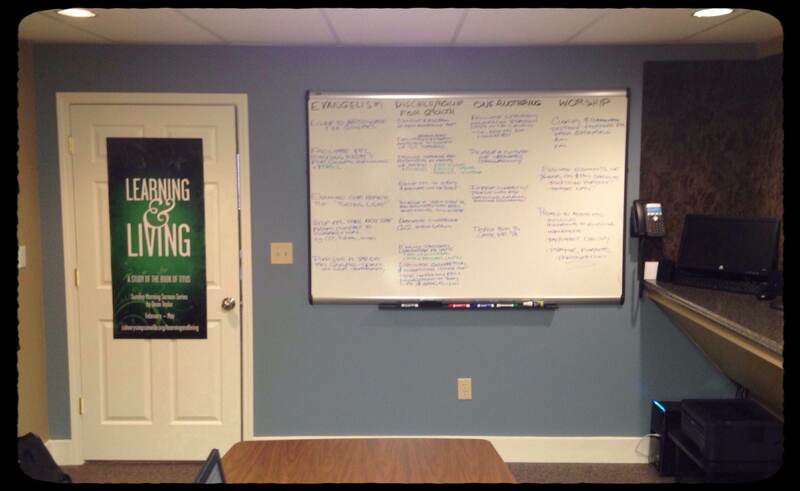 I use this to keep ministry plans and goals in front of me, and sometimes for visionary brainstorming. 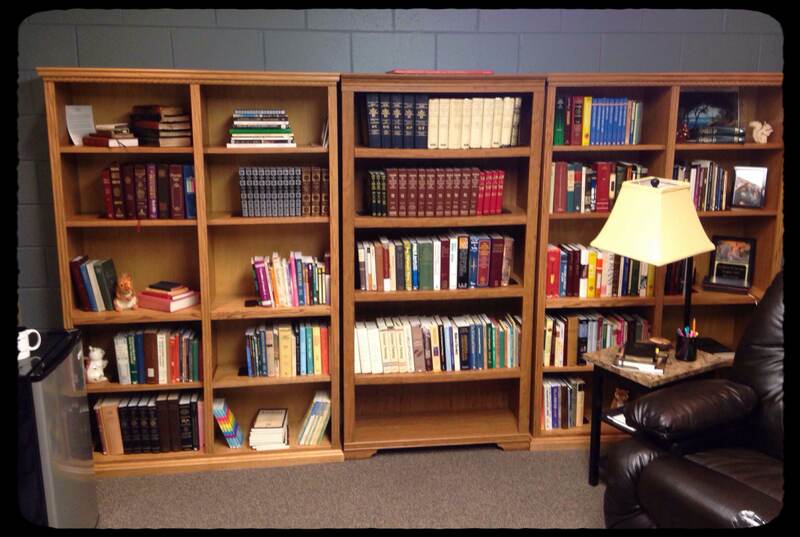 I have some books in my upstairs office, but most of the hard copy books I use for studying the Scriptures are on these shelves. Many of my study resources are in electronic form. 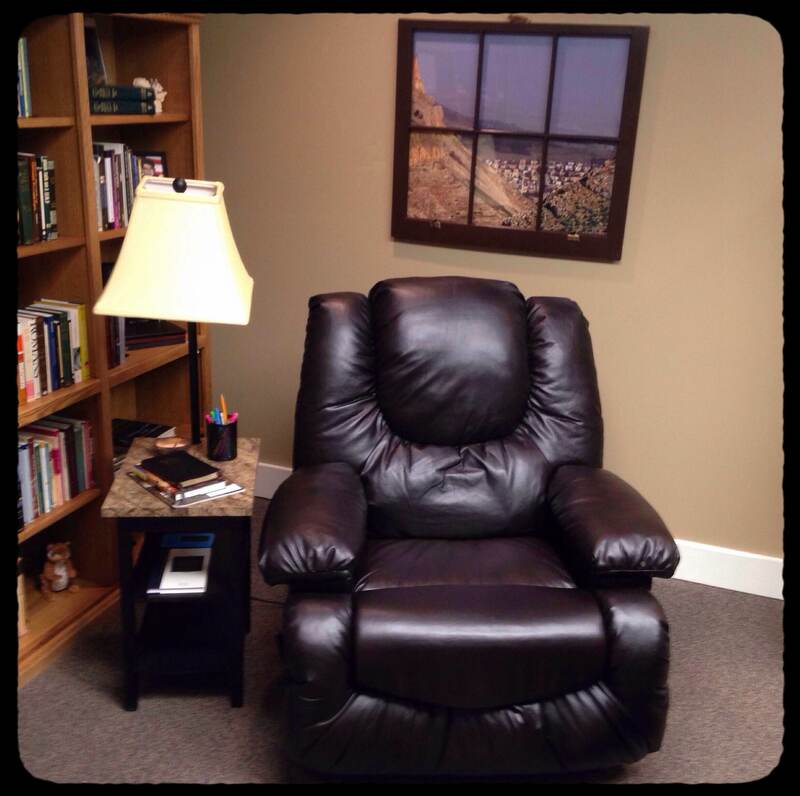 This reading and praying corner is almost too comfortable, especially since the chair is a recliner. Who doesn’t need a power nap now and then? A few times I’ve joked that “The only thing my study is missing is a window.” Well, our very thoughtful staff members gave me one! 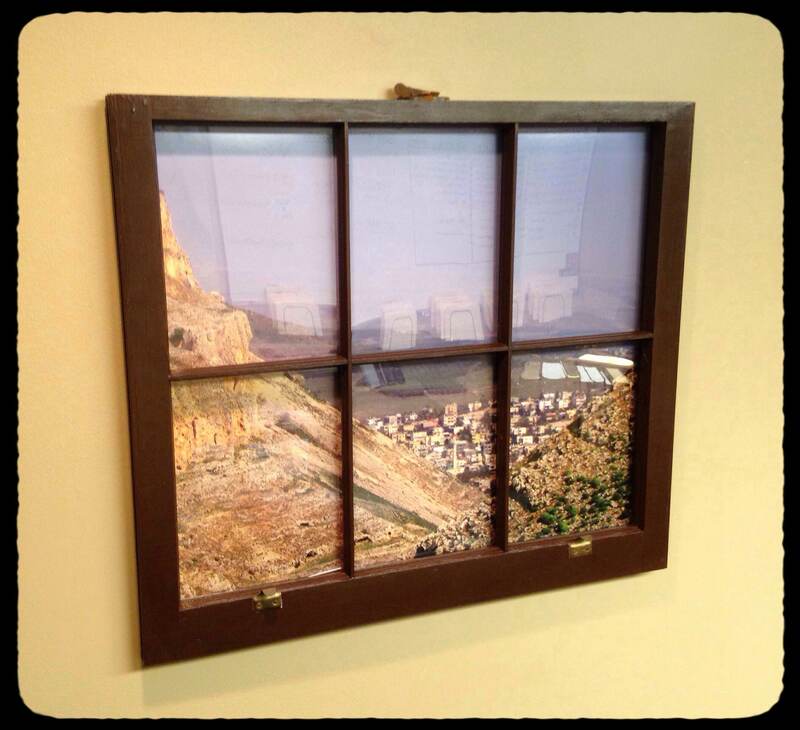 For my birthday, they gave me this window with a “view.” The picture is actually one that I took on our recent trip to Israel. They even gave me more pictures so I can change them out when I want. Perfect!!! 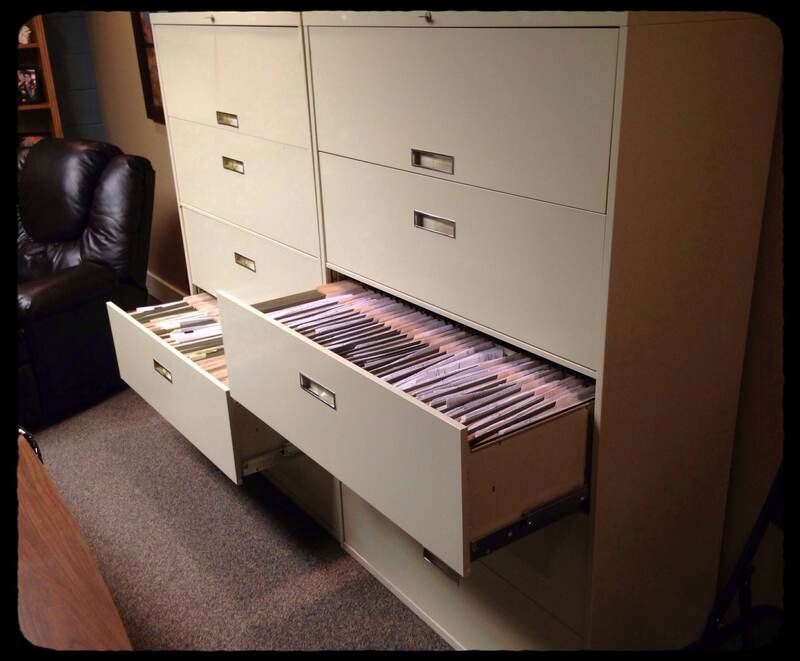 I keep hard copies of all my sermons as well as some of my study notes in these file drawers. I can look up sermons by title, text, date, occasion, or topic on an Excel spreadsheet on my computer, and then either pull sermons out of the hard copy file, or access pdf files of them on my computer. I love this capability. On this tour you’ll notice a few other things, such as the poster on the inside of the door, which is left over from the promotion of a sermon series last year; the fuel station, aka refrigerator and Keurig coffee maker; the Bible stand on my desk (another gift); and of course a place to hang my coat and hat. 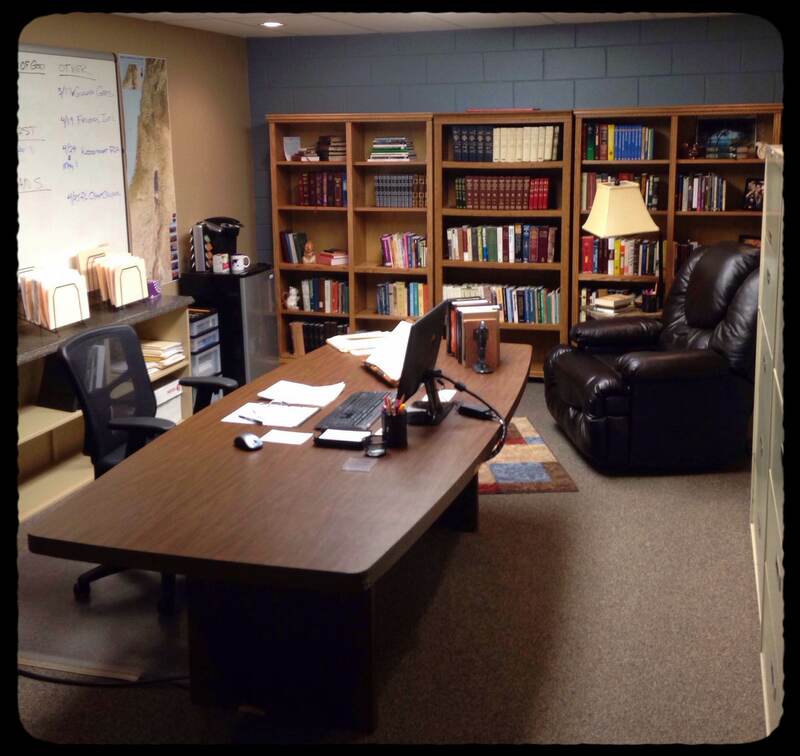 I realize that I have something special here, and not every pastor can dedicate an entire room to being a place for study, meditation, and prayer. In fact, my “Batcave” has only been in use for about two years. Before that I used my regular office (hard because I had to clear my desk for administrative work or appointments), or tried to study at home (lots of distractions), or spent a morning at Panera (which I still do sometimes). But if it’s possible to have at least some space used solely for study, it can make a preacher of the Word more productive, I think. Thanks for sharing. Good to know you can get away from the distractions and hear for God. We enjoy your messages. As you preach I try to write the highlights on my iPad for Cindy to know the content of the message. 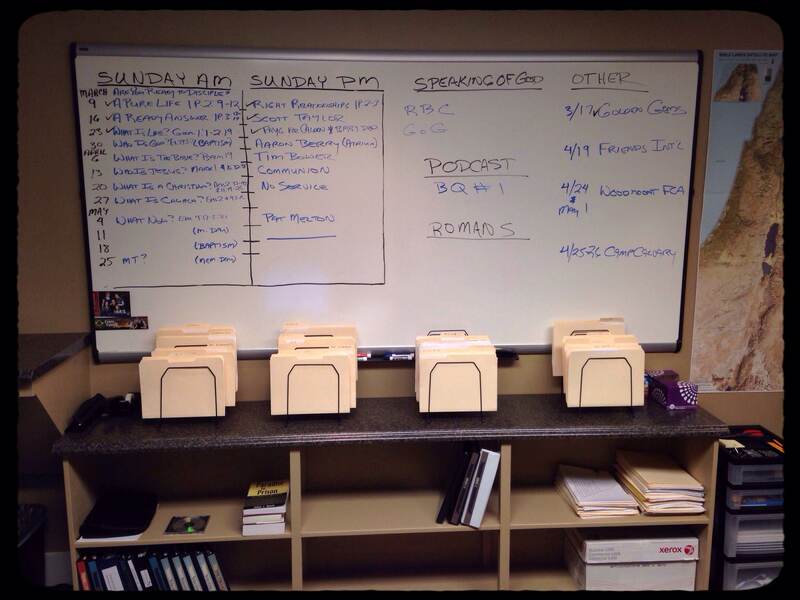 Do you have transcripts available before you preach them? If you do would you be open to sharing so she can follow along? Just a thought. Thanks. I’m praying for you. Pastor Dean, The Batcave is excellent. It motivates me to get busy on my own “Fortress of Solitude” or something. I will also be sharing this past Sunday’s PM message on parents and their children with our own daughters as soon as it posts. Have a blessed week. Pastor, I think that Bat Cave is great. When I pray for you I most always pray that God will protect you time of Study in the Word. What a wonderful room He has given you. I like that window too. Lorena, you know where that came from :). Don, I am sorry but I do not have my messages written or typed out in a form that I could give to you before I preach. The notes would be impossible to interpret, both because they are partial thoughts rather than full sentences, and because of my almost illegible handwriting. I wish I could provide something for you to help Cindy.